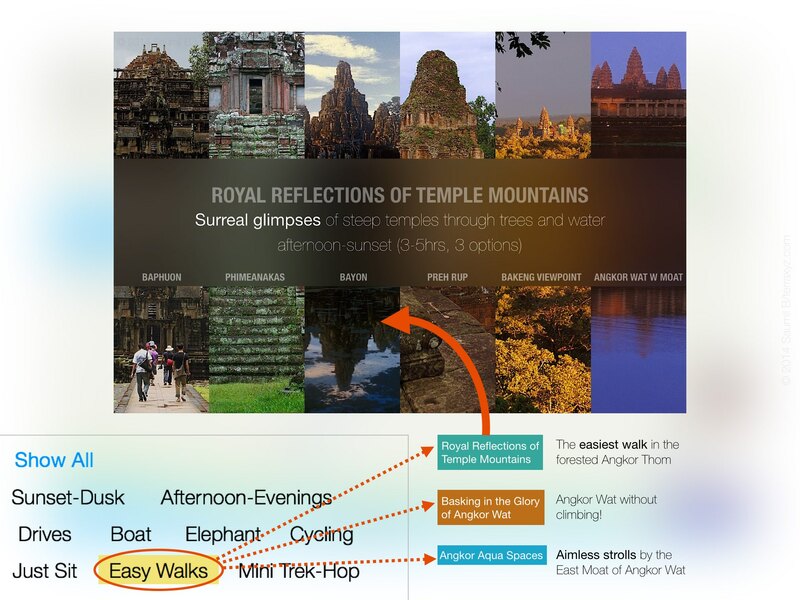 This app is about trips, a collection which defines Angkor. - Easy mood trips yet an authentic experience. Self guided at your own pace. - It takes about 10min to choose a trip from our card-size previews. Thereafter, within 3 taps you can implement it on a GPS map. - Our photo slideshows give you insight and tips to enhance your experience at each spot. Find niches at popular spots, which ones are uncrowded/hidden, and wait at unknown spots in-between journeys! (you cannot search these online). - Our new tag interface makes selecting a trip even easier. Like to sit & unwind or rather walk a bit or just reach at evening-sunset? The tags will indicate which trip to take and which spots to focus on. The photos are a first hand experience, which will help you choose (skip) the right trip or spots. - Each photo is shot by the author. So what is experienced over a decade, across innumerable trips, can be yours on your first! - 700mb of visual content is built in the app so all content/slideshows play smooth on iPad without an internet connection. You can even watch on TV via Airplay/AppleTV. 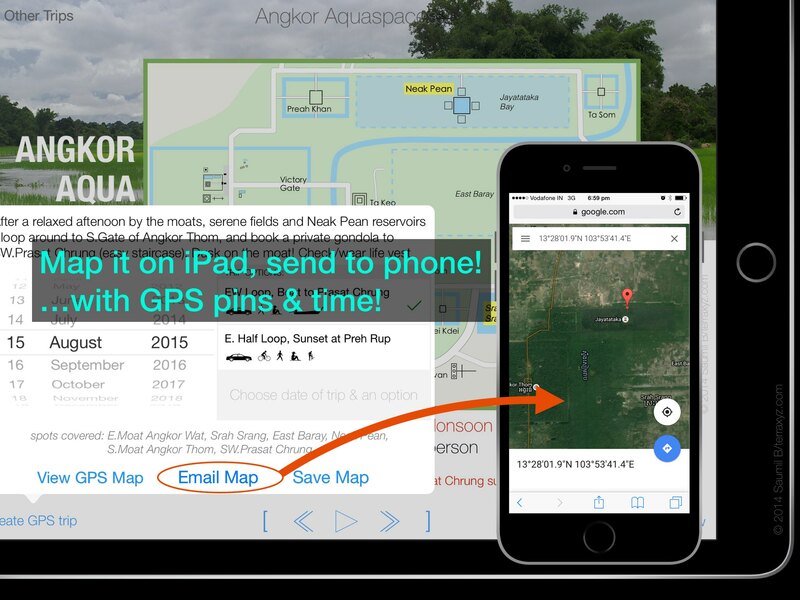 note: GPS Maps on the iPad or the pins emailed to a smartphone, will need a connection for map tiles too display smoothly. GPS trips have photo pins with time stamps, so that you are at the right place at the right time. Never miss a sunset! - The GPS Trip time is different each day, based on sunset time! - Plus overlay maps for each spot, for details about where to wait/walk at that spot. Again, such overlays of spots/areas and thumbnails of sites, are built into the app and will display fine without an internet connection. - Now the email option includes GPS pins of each trip spot. You can just carry your iPhone or any smartphone with Google Maps. However, since most trips involve chartering a car or van, it is really worth keeping the iPad as well. 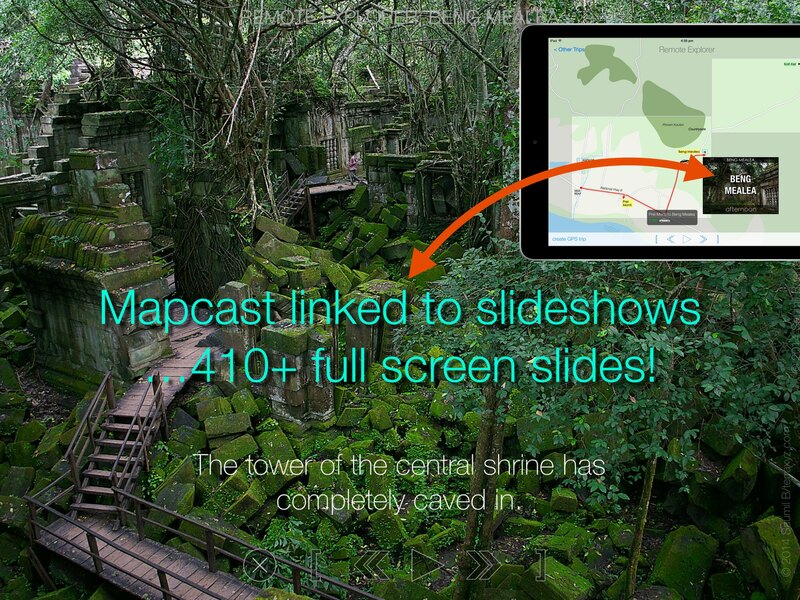 You can follow the slideshow, change options or even trips on the go besides other trip details and specific full screen overlay maps at each spot. 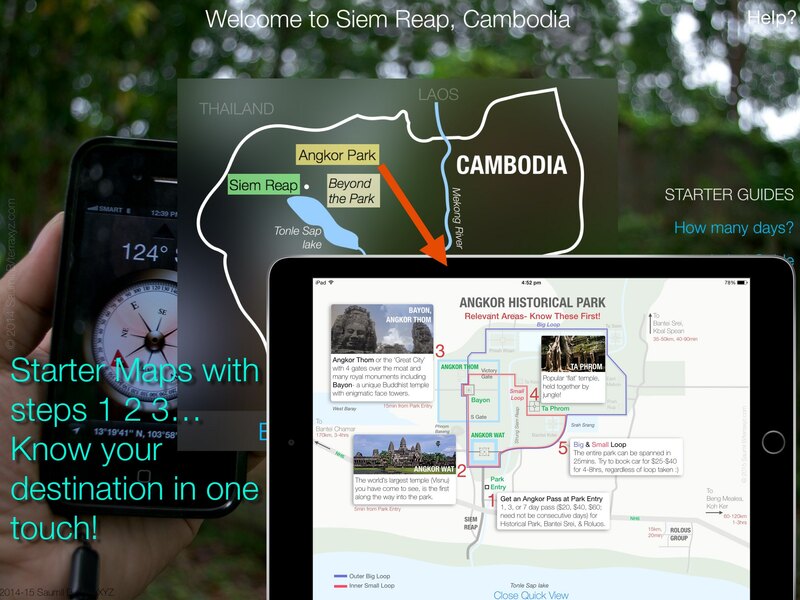 Our app is about trips, but we have 2 starter guides and 4 first-maps. 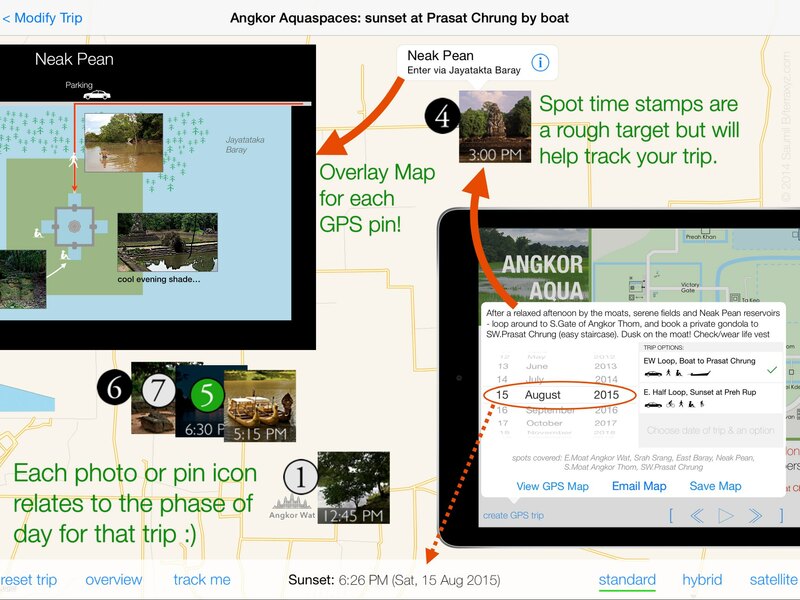 Within minutes, you can tap 4 quick maps, which give you an overview of Siem Reap, Angkor areas and Phnom Penh in easy chart style 1-2-3 steps. In the starter guides, we have listed boutique/exclusive resorts known to us over a decade (various budgets, but nice experience). But most importantly, you will learn how to choose your hotel based on your criteria. hint: does staying closer to Angkor Wat help? We also offer a basic set of restaurants, shops, and local spots within Siem Reap for casual activities. In fact, our mood trips are in the afternoon/evening, so you do have time in the morning and night for lots of local activities (or inactivities ;). Our app has enough for 10-12 days of self-guided outings. We do include some trips which you need a guide (at least a day or so for first-time visitors) and also some trips which are beyond the region. But typically it will be great if you stay for 5-7 days. This way you can relax and do justice to Angkor as well. Note: you will need minimum 3 full days for our app to be useful. Those who are just intending to take a day pass for selfie at Angkor Wat, are welcome to buy our app, but as a souvenir not for the trips! However, for those who are willing to take a 3/7 day pass (US$40/60), we promise you will be able to relax and experience a variety of moods which Angkor offers. "The days of static guides with loads of information has passed. We are committed to bringing you the best of both worlds- mobile GPS mapping and our first-hand experience in a visual manner."